Hamas promises to 'gradually' end violent border riots and incendiary kites, balloons, report says. 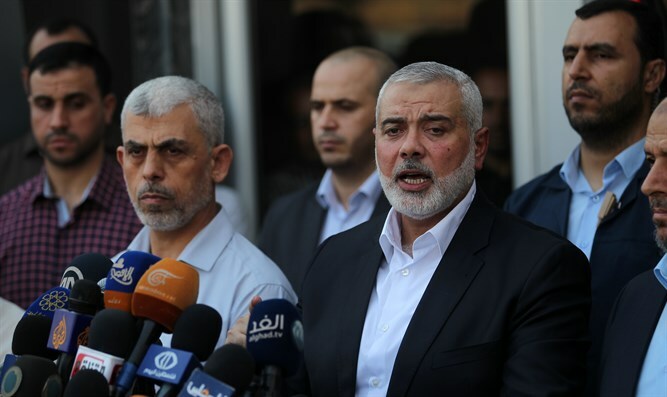 Hamas has agreed to a "gradual" ceasefire, London's Asharq Al-Awsat reported Monday. The ceasefire will begin with a cessation of Gaza terrorists sending incendiary kites and balloons into Israel. According to the report, Israel has agreed to remove the latest sanctions on Gaza in exchange for an end to the incendiary kites and balloons. Hamas sources quoted in the report said all Palestinian Authority and Gaza factions have been informed of the agreement. They also said that in exchange for a cessation of all types of violence on the Gaza border, Israel will reopen the Kerem Shalom crossing to commercial goods and expand the Gaza fishing zone. Last month, Hamas promised to gradually end the use of incendiary kites and balloons. However, Hamas then claimed that it is incapable of ending the attacks unless Israel first reopens the Kerem Shalom crossing, which was closed in response to over three months of attacks on Israel.